A chemist by profession and intuition, Mirella Buscemi, was born near Siracusa. Inspired initially by her grandparents, who owned vines & made wine, Mirella fell in love with Etna. She owns a property of 3.6 hectares, which includes a single 1.5-hectar vineyard of old vines. in the contrada of Tartaraci, near the southern volcanic town of Bronte, Etna. The Tartaraci plot was given to Admiral Horatio Nelson, the former Duke of Bronte, on October 10, 1799 in recognition of his role in defending the island of Sicily from Napoleon Bonaparte and the “dastardly” French who at that time were trying to annex the Bourbon south of Italy. Fascinatingly, the circa 90-year-old vines comprise not only Nerello Cappuccio & Nerello Mascalese, used in the rosso, but also c. 30% Granaccia (Grenache). The latter was most likely imported by the Bourbons and planted at Tartaraci to offer a fruity softness and fragrance to the highly mineral Nerello…especially as the vineyard is at 3,215 feet above sea level! The same viticultural approach was applied for the scarce quantity of bianco vines: here they planted the fruitier Grecanico (c. 30%) alongside the indigenous, but sapid Carricante (70%). 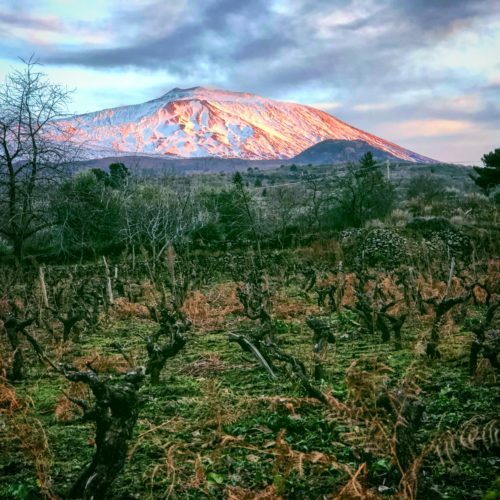 Mirella Buscemi, who is married to the award-winning northern Etna winemaker, Alberto Graci, matches her husband’s dedication to the terroir of Etna. The couple’s strong conviction of the importance of crus on Etna is markedly present in their wines. Unlike the Passopisciaro Graci wines, whose rusticity reflects the high-elevation, northern part of the volcano, Buscemi’s character is more reflective of the Southern town of Bronte where the grapes grow – delicate, kissed by the sun and lifted to a delicate elegance by the high elevation and old vines. Mirella uses only concrete and large botte/tonneaux to make her wines.